Trying to stay cool has been a full time job around the farm lately. We did have a bit of a break over the weekend, but the weather forecast shows us heading back into the mid-90's in the next few days. We all have our ways of coping, as best we can. The animals move as little as possible during the daylight hours and do their grazing at night. There are four fans running in the barn right now and that is where they hang out during the day. 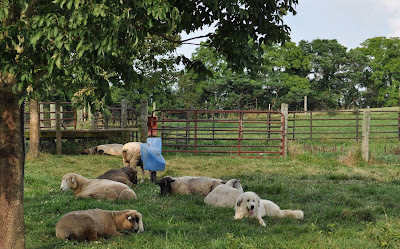 Last week, I kept noticing that the automatic waterer that's shared by the llama/alpaca pen and the lamb's pen was filthy every evening when I brought the lambs in for the night. Sheep do not like dirty water and will not drink from it. It took me a while to figure out what was going on. The alpacas were cooling themselves by putting their feet in the waterer and splashing water all over the place. Yesterday I found a tub that we used before the waterers were installed and pulled it into the back barnyard. I filled it full of water and stood back to watch. Prince, who is the boldest one of the herd, stepped right in and tried his best to figure out a way to lay down. Failing that, he stood in it and splashed water until the tub was nearly empty. Next thing I know, they'll be requesting a swimming pool! Holly moves around all day looking for a cool place to catch a nap before her night-shift begins. 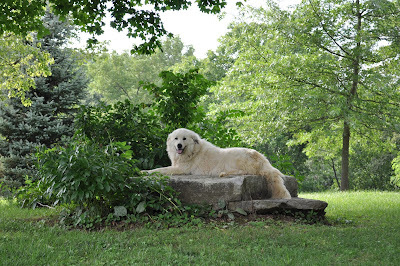 The cemetery rock is a favorite spot because it's shady all day and I'm sure the rock feels cool on her stomach. Plus, it's a great vantage spot for keeping an eye out for any predators. An elderly woman who grew up in the big log cabin that stood on our house site (before it burned down), told us about all the different people buried on that spot. They were her ancestors and she had a story for each of them. When we bought the farm, there was only evidence of one grave marker, so when this huge rock came up out of the ground when our farm road was rebuilt, we decided to use it to mark the cemetery. The rock forms a natural seat and is a great imaginary stage or boat or mountain for the grandkids (and a wonderful observation platform for Holly). I hate to wish my life away, but I'm already dreaming of cool autumn days and nights. Hope you are staying cool, wherever you are! I am wishing some cooler weather for you..and weather that would stay cool! In Western Or. we have had some very hot days, but we don't have the humidity and it always cools off at night. Today is perfect here, so I will try to send some cooling breezes your way. I love the splashing around those adorable guys do. I have three Newfoundland dogs and one will submerge her entire face in the watering bowl, as well as her paws. Best to you, Ellen K.
I must confess with my schedule these days, I am in the air conditioning more than ever and not too bothered by the heat....but I don't like it nonetheless. My wife and I recently added sheep to our little farm operation. I don't know why we waited so long. We have a couple East Friesians and a Katahdin. More will be added next spring.